Making the decision to have a sick hen put to sleep is the hardest one of all, but one we all have to make at some point. Some girls will die in their sleep, in their coop, with their sisters around them and, if truth be told, this is what I hope for. But sometimes, after you have nursed her and cared for, she is obviously suffering, and you have to make that decision for her. Hard as it is, remember it is done out of love. Once the vet has checked her over and agrees with your diagnosis that nothing more can be done, he will inject her, usually under the wing, and you hold her as she goes to sleep. I have lost a few girls this way and they do just fall asleep. I cradle them and stroke their feathers and talk to them the whole time. Hearing is the last sense to go and I am sure they die knowing they are loved. It is little comfort to us humans but I am sure it helps the hen pass more peacefully and at the end of the day they are what is important. Remember also that if you lose an ex-batt, your other girls will grieve for her too. They will have seen her become unwell and her closest friends will have nursed her during her illness. Unless they are with her when she goes they will not understand where she has gone. important they remained a flock in death. Each girl has their own grave with a stone, picked from Portreath beach, and decorated with their name, hearts and flowers. However, burying hens in your garden is actually illegal as the wise sparks at Defra still class chickens as livestock and not pets. The law is very complex as you cannot bury or cremate or bury livestock. However, after speaking directly to Defra they said there is a ruling that states you can cremate a single pet and bury the ashes. (chicken shaped) for decoration really but also for airflow and lots of small holes (8-10 mm in diameter) in vertical rows down the sides near the bottom to get air flow circulating. We use dry, fast burning wood, usually old pallets or pine which are chopped up and stored in the garage just for this purpose. The first batch of wood is burnt using an accelerant such as white spirit to ensure it gets really hot. Then a second batch of wood is burnt and once that has got going, a flat section in the wood is made and the hen put in. She is wrapped up in something soft to keep her warm. I am currently using some pink material with flowers on that I have cut up into chicken blanket sized pieces which is suitably pretty and feminine. A spade is the safest way to lower her gently into the flames. We also place a flower, special to the girl, in with her. Miss Constance Chicken, for example, always liked to sit in between the pond and the big white flowers, so when we cremated her, I placed some of these white flowers in with her. She was also quite a whiffy girl in life due to her bottom issues so I also put some rosemary in with her to make sure that she smelled beautiful. I think she would have appreciated it. The fire is stoked to keep it very hot and a third load of wood added to keep it burning for another hour or so. Then the embers will do the rest. Overnight it will finish off and by the morning there will be just ash and maybe the odd small bone but nothing nasty. There is also no smell at all. 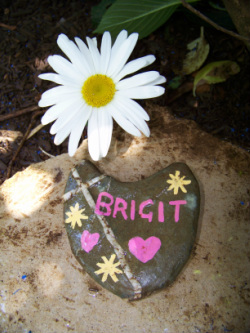 with the A girls, each girl has a stone, picked from Portreath beach, and decorated with her name, hearts and flowers and placed on the grave. What we must try to remember is that every day these girls spend out of the cage is a good day. Every day they can forage and scratch and spread their wings, every day they can dustbathe and preen and sunbathe, chase flies and hunt for worms. Every day they can do all these things is a good day, be it for just one day or for many months or many years. They were the lucky ones. Hundreds of thousands of their sisters live in cages and die in fear. No-one buries them and no-one grieves for them. They have no name, no identity, no dignity and never knew what it was like to spend their days in the sun or feel the love and kindness some humans can give them. As ex-battery hen owners we are fighting against the physical and emotional scars that intensive farming inflicts on our poor hens. It is a battle we cannot win but we can rescue as many hens as we can and surround them with the love they so deserve.